Set up five target areas with skipping ropes. Players must stand behind the throwing line. Players attempt to score the highest number of points by throwing a beanbag into the target areas (players alternate taking turns throwing the beanbag). After each player has made five throws, players then go collect their beanbags, add up their points, and proceed to find a new player who they can challenge. Set up the throwing line approximately five feet away from the closest target zone. 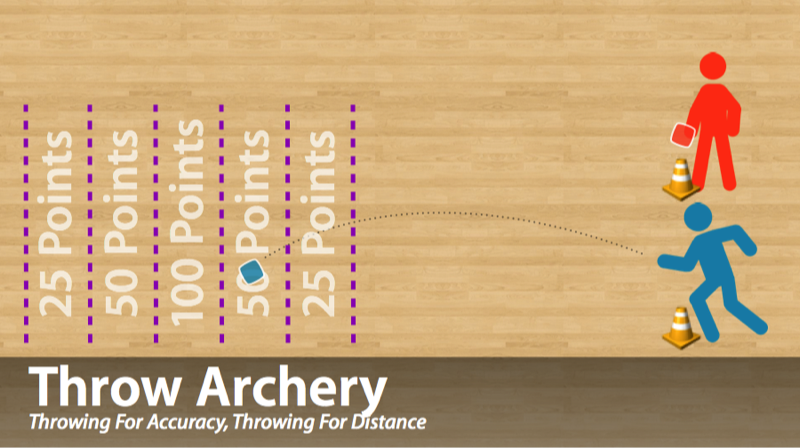 After each round, have students back the throwing line up by an additional five feet. Play the game as explained above, however students must roll a tennis ball rather than throw a beanbag. How do you get the beanbag to land in a high-scoring target zone? How does throwing from closer/further affect your throw? Make sure students do not throw/roll when another student is in front of them.